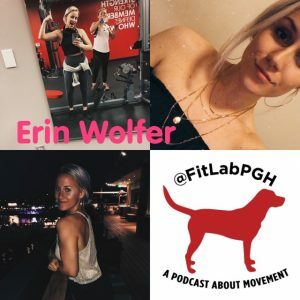 FitLabPGH is a podcast about movement and movement opportunities in the Pittsburgh, PA area. Once a week we also highlight a FitLabPGH mover…someone who understands that movement is a lifestyle…not just an activity. The questions are lightly edited to allow for easy readability. Click FitLabPGH Features for more info if you want to be featured/know someone who should be featured. Are you a Pittsburgh native? If not, what brought you to the Pittsburgh area? I moved to Pittsburgh when I was 6. Describe your fantasy movement-focused vacation…cost is not an object…where do you go and what do you do? Beach workout! What is your go-to weekday breakfast? Your weekend breakfast? Avocado toast with eggs and breakfast potatoes! What movement activity/event are you looking forward to in the next year? Launching the new THRIVE studio at Oxford Athletic Club, and Cheerleading Worlds in April. I was a competitive cheerleader for 10 years.